Ramble through history, beauty and charm on this leisurely exploration of the Amalfi Coast. Your footsteps will fall on the Path of the Gods, pass ancient paper mills and lime pits, and lead through rural woodlands and lemon groves, jasmine-scented gardens and pastel-colored villages clinging to cliffs, with views sweeping out to sea. Along the way, see how time halted in Pompeii, and encounter the present day at artists’ studios and an organic farm. Delicious Neapolitan cuisine, pastries and gelato enhance your experience of this sensually delightful pocket of Italy. This tour features a combination of paved roads and easy terrain, mixed with moderate hills, uneven footpaths on downhill slopes, and many cobbled steps. On rainy days, the footpaths can be muddy, and steps can be slippery. Van support is limited due to distinctive features of the region. Both morning and afternoon walking options are available most days. Ideal for experienced walkers and enthusiastic beginners who usually hike. Several of the walks require a transfer from the hotel to the start of the walk. Our Trip Leaders often use this time in the van for a morning route review, so you can enjoy a more leisurely morning at breakfast. Please be aware that The Path of the Gods may affect people who experience vertigo. Depart from home for Naples, Italy. The particulars of your arrival overseas are detailed with your flight itinerary. Arrive at the Capodichino Airport in Naples, Italy, where a VBT representative meets you and helps you transfer (approximately 30 minutes) to your Naples hotel. The rest of the day is free to discover and dine on your own, using the VBT City Information as your guide. If you are going to be delayed meeting our transfer representative for more than 15 minutes due to delayed or lost luggage, please let our driver know by calling or sending a text message to +39 340 952 5525. The driver is generally able to wait for up to 45 minutes from the time your flight lands, after which you would be responsible for your own transfer. You may also contact our One Call travel assistance to advise of your delay, and they will contact our transfer company. Please note: If you arrive early, your hotel room may not be available until 1:00 p.m., in which case you may store your luggage with the reception desk. You have the rest of the day free to discover this fascinating city on your own. Perhaps you’ll explore one of its many museums, or stroll through the picturesque Borgo Marinaro neighborhood, located just across from our hotel. Tonight, dine on your own in one of the cozy restaurants nearby. VBT Air Package and Pre-Extension guests: Meet your VBT Trip Leaders at 9:00 a.m. in the main lobby; they will be wearing VBT staff garments. Please come to the meeting dressed in your walking gear and carrying your backpack. Please have your luggage already down in the lobby before the meeting starts. It will be collected by our transfer company. After an orientation and safety briefing led by our Trip Leaders, you’ll board a private motorcoach and transfer to Pompeii. Upon arrival, meet a local expert for a guided tour of the site. At dawn on August 25, 79 AD, the violent eruption of Mount Vesuvius caused the total destruction of Pompeii. In just a few moments, all the residents of the city perished, doing whatever they could to survive. Tremendous amounts of ash and cinder covered and preserved the scene exactly as it was at that instant. That’s why, today, we know exactly how Romans lived 2,000 years ago. Your guide will reveal, for example, that posters were used to advertise elections and support party candidates, and that the word “candidate” comes from candid, the name of a special tunic worn by those running for office to prove they had no criminal record. Lunch is on your own in Pompeii. Early in the afternoon, shuttle to your hotel in Ravello and settle in. Later in the afternoon there is still time to roam the terraces of Ravello with your Trip Leaders, beginning in the peaceful, pedestrian-only center. Admire the white-faced Duomo in Piazza Vescovado and the Arabic-Norman towers of Villa Rufolo, where German composer Richard Wagner was inspired to create music for the scene in Klingsor’s magic garden in his opera Parsifal. Tonight, enjoy a welcome cocktail on the panoramic terrace of our hotel before moving to the dining room for dinner. Daily Options: 2 miles in Pompeii on flat, cobblestone roads, plus 1 mile in Ravello on paved city streets. After breakfast, trace lemon-laden terraces to the Valley of the Ferriere, a magnificent nature reserve in the Valley of the Mills. As you proceed along a trail covered in moss and ferns, your Trip Leaders will show you calcara, large pits where lime was made by burning huge blocks of limestone for days. You’ll also see the spandituri, or paper-hangers, buildings now in ruins but once used to dry paper. As you reach Amalfi, you’ll stop at the Museo della Carta, a unique museum housed in an ancient paper mill, where you’ll learn how paper was made from rags. During the 15th century, Amalfi’s paper was so prized that many foreign authors demanded to be published in Naples just so they could use the coveted material. You can buy some of this exquisite handmade paper in the museum’s gift shop. In Amalfi, enjoy time at leisure to visit the beautiful Duomo and stroll along the charming side streets. Sit down at a sidewalk café to enjoy lunch on your own and maybe try a delizia al limone—a confection made from limoncello-soaked sponge cake and lemon custard—or a slice of pastiera, a cake made with ricotta cheese and ground wheat that’s been soaked for several days in running water. Early this afternoon, follow your Trip Leaders on an optional energetic walk through the whitewashed alleys of Atrani – the smallest Italian municipality – and all the way up long stairways to Pontone and Ravello. Back in Ravello, you have time to relax by the scenic swimming pool of your elegant hotel. Or continue exploring Ravello on your own, keeping your eyes open for a restaurant for dinner on your own tonight. Daily Options: Morning: 3.1 miles on a gentle uphill to start, then a 1-hour descent on rolling dirt paths and steps. Afternoon Option: 3 miles on paved steps uphill. Initial gradual ascent in Atrani through the village alleys, then mostly steep stairways until Ravello. Walk out of Ravello, passing by remarkable monuments and churches. And then, the dramatic green shades of the Dragon Valley come into view with the sea in the distance. Ravello is famous for its churches and you’ll pass many on today’s ramble. The 11th century San Giovanni del Toro church is one fine example. The route is initially paved following the Valley of Rheghina Minor downhill. Your route then meanders on a well beaten pathway through a rural landscape of woodlands, passing former paper mills and a few scattered houses. You may occasionally pass pack horses and mules, a transportation method used for ages on the Amalfi coast to carry heavy loads up and down the mountains. You’ll walk into Minori before lunch time to enjoy the beach and taste the sea with your toes, or more if you like. Feel free to explore the Roman villa (no charge) en route. Founded by the Etruscans in 7th century B.C., Minori was a favorite Roman summer residence. In Minori, experience the local art of ceramic in an included hands-on class where you will craft your own tile under the supervision of a local artisan. Choose from the many cafés for lunch. One highlight is the Sal De Riso pastry shop for decadent cakes. Early this afternoon, shuttle or walk back to Ravello. The 1000 step climb is certainly rewarding for the views. Back in Ravello, continue your exploration. Perhaps you’ll visit Villa Cimbrone and its beautiful gardens. Ravello is well known for its classical music festivals. To see what’s playing and for assistance with booking tickets, contact the reception desk. Daily Options: Morning: 3.4 miles descending to sea level on paved roads and dirt paths. Overall easy and relaxing. Afternoon Option: Optional 1 mile walk on paved and steep steps uphill. 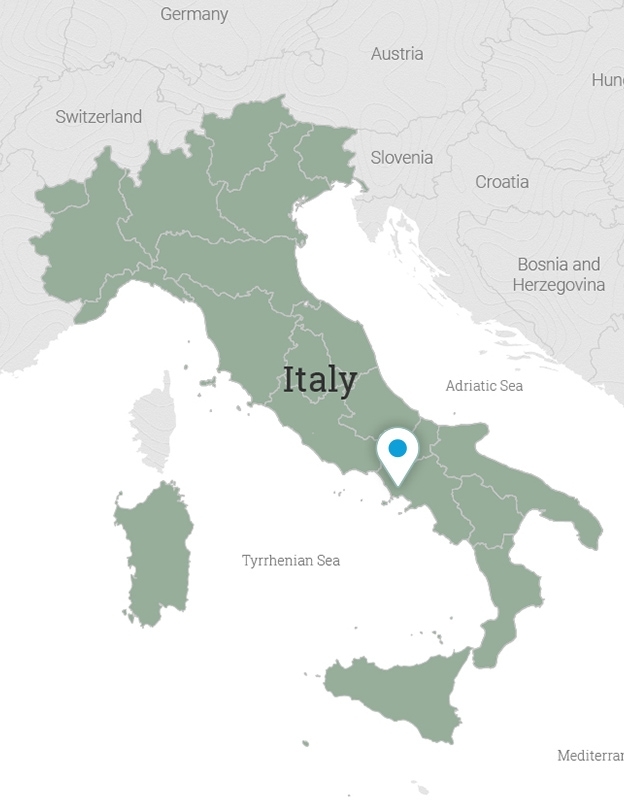 6 Thu, May 2, 2019	Agerola and the "Path of the Gods"
Today, shuttle to Agerola, Italy’s dairy capital, where you’ll gradually descend on foot along a scenic stretch between Biscotto Caves and Nocelle known as the “Path of the Gods” for its heavenly views. The path is well marked and offers views of Capri and the islets of Li Galli, or Sirenuse, where the mythical Sirens attracted seafarers with their melodious songs. At Colle Serra, cross the pass and continue down to Nocelle, where you’ll savor traditional Neapolitan dishes on an included buffet lunch at a family-run trattoria. Later, shuttle by van to Positano, built as a nativity scene set on the side of a mountain. Enjoy time at leisure to browse its art studios, rest your legs with a beachside nap, or join your Trip Leaders for a short jaunt. Positano’s narrow streets are filled with art galleries and boutiques. The clothing industry in Positano was so popular and influential in the 1970s that the style they created became popularly known as “Positano Style.” In addition to clothing, you can find handmade ceramics, jewelry, leather footwear and paintings by the many artists who have been inspired by the beauty of the region. Regroup with your Trip Leaders later in the afternoon and transfer to Sorrento. Settle in at your deluxe historical hotel, a former Jesuite monastery and the oldest hotel on the peninsula. Tonight dine at your hotel’s fine restaurant. Daily Options: 4 miles descending on dirt paths with some rocks and steps. Afternoon Option: Easy stroll in Positano on paved roads and alleyways. 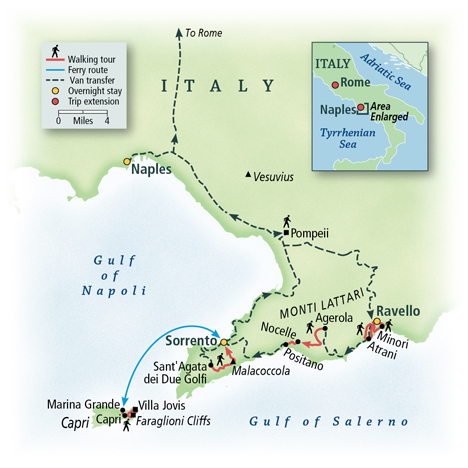 Early this morning, board a hydrofoil to ferry across the Sorrento Peninsula to the celebrated island of Capri. Arriving at the famous piazzetta, the hub of the island, you’ll set out along an easy walking path leading to Villa Jovis. As you stroll, your senses will be enchanted by the aroma of jasmine and views of manicured gardens full of flowers. You’ll explore Villa Jovis, built by Emperor Tiberius in the first century AD as a strategic point where he could dominate and control the opposite coast. Enjoy incredible views from here. The Jump of Tiberius—a sheer cliff soaring more than 1,100 feet—is the infamous site from which Tiberius had his enemies thrown into the sea. Continue walking through a thick Mediterranean park where strawberry trees, myrtle, clematis, honeysuckle, laurel, wild asparagus and cyclamen thrive. After passing by Villa Lysis, built by an eccentric French count in 1905, you can choose to explore Capri’s inviting shops and cafés, or continue to Arco Naturale and Grotta di Matermania, a natural cove used to honor Cybele, the Magna Mater, or Great Mother, of the gods. It is located down a long flight of stairs and in a thick forest. This is also an ideal time to stop for lunch on your own in one of the island’s cozy restaurants or to picnic in the shade of a garden overlooking the azure sea. Your small group will gather after lunch and walk to the eastern rim of the island. Here, you’ll see the amazing and famous Faraglioni cliffs, three rocky colossi protruding from the sea. Then, venture to the Augustus Gardens, where the views of the cliffs and the curled Via Krupp are gorgeous. The trail ends at Capri’s shopping district. From here, loop back to the piazzetta, where you began your walk. You’ll have some time to discover the fascinating area around the piazzetta before returning via hydrofoil or ferry to the mainland and Sorrento. En route, take in the panoramic vistas of the Amalfi Coast from the sea. Walk back or shuttle to your hotel and spare some time to enjoy the hotel amenities, including a large manicured garden with swimming pool and private beach. Dinner is on your own tonight. Perhaps you’ll try Gnocchi alla Sorrentina, made with a tomato sauce and fiordilatte (local mozzarella). Daily Options: 4.5 miles on flat to slightly rolling paved and cobblestone paths. Afternoon Option: 1.7- to 2.7-mile descent with steps. Today, you’ll drive to Sant’Agata dei Due Golfi to the Sorrento Peninsula, where you’ll follow the red-and-white markings of the Alta via dei Monti Lattari trail, a path that winds upwards into a beautiful chestnut forest. As the woods open up, masses of multicolored, aromatic flowers are on display. Right before the promontory of Malacoccola, the view of the entire Gulf of Salerno opens before you. Your lunch stop is an organic farm that has been owned by five generations of the De Gregorio family. You’ll visit their impressive vegetable garden and step into the rooms where olives, tomatoes, broccoli, eggplants, hot peppers and much more are created into delicious preserves and liquors. Later, choose to return to Sorrento on foot or by shuttle, taking in more views of the gulf from above. In Sorrento, enjoy free time to shop, explore the town, or relax at your hotel’s swimming pool and private pier. Tonight, you’ll gather with your travel mates to feast on gourmet specialties during a festive farewell dinner at a nearby restaurant, right on the cliffs of Sorrento. Daily Options: 4.4 miles on a dirt path with some rocks, kindly and constantly ascending, then downhill on steps. Easier option: 3.3 miles on a gently ascending dirt path. Afternoon Option: 3 miles downhill with many steps. VBT Air Package guests: This morning, enjoy breakfast before boarding our private coach at 8:30 a.m. You arrive at your Rome hotel at approximately 1:00 p.m. after a short stop on the way. The hotel is centrally located and near public transportation. Upon arrival at the hotel, a VBT representative will answer your questions and offer optional city walks and visits that will help you make the most of the city. VBT provides City Information containing recommendations about what to see and do during your stay. If you have chosen the independent Post-Trip Extension to Rome, you’ll remain at this hotel for a total of three nights. Tonight’s dinner is on your own with plenty of options nearby. After breakfast* this morning, transfer to Rome Fiumicino airport (50-60 minutes depending on traffic) for your departing flight**. Please ensure you are ready in the hotel reception area at the designated time. *Please note: For guests with early-morning departures, breakfast at the hotel may not be available. Please check with the reception desk to verify the times when breakfast is served. **VBT recommends that you check your transfer time in your “Transfer Reminder.” VBT transfer times and departure points are finalized in advance and cannot be modified for individual guests. If you extend your stay beyond the scheduled program dates, return transportation to the airport will be at your own expense. VBT Walking Vacation only guests: Meet your VBT Trip Leaders at 9:00 a.m. in the lobby of the Grand Hotel Santa Lucia (Via Partenope 46, Naples; Tel: +39 081 764 0666); they will be wearing VBT staff garments. Transfer to the hotel is on your own. Please come to the meeting dressed in your walking gear and carrying your backpack. A taxi from the railway station costs about 15 euros/$20 USD. If your arrival at the hotel is scheduled for later than 9:00 a.m., or if you are delayed, please contact the hotel and the hotel staff will pass your message along to our VBT Trip Leaders. If you are delayed past our 9:40 a.m. departure time, please transfer directly to our Ravello hotel. However, you will miss the visit of Pompeii. 4 Thu, May 2, 2019	Agerola and the "Path of the Gods"
VBT Walking Vacation Only guests: This morning, enjoy breakfast before boarding a private coach at 8:30 a.m. The coach will drop you at Naples airport at approx. 10:30 a.m., where your tour ends. A taxi to Naples train station and city center costs approximately 16-17 Euros. If you prefer, you are welcome to continue to our Rome hotel and end your tour there. The oldest hotel on the Sorrento Peninsula, the Grand Hotel Cocumella was built in 1637 as a Jesuit residence, becoming an inn 140 years later. Its elegant rooms, antique furnishings and exceptional views of the sea and grounds have attracted such visitors as Goethe, Mary Shelley and Freud. Set in a century-old park overlooking the sea, the hotel features a swimming pool, along with a private pier and sun terrace, for swimming in the sea. There are also a fully equipped gym and spa. Scintilla, an open-air garden restaurant, features local specialties, while Coku offers a fusion of Mediterranean and Japanese cuisine. Only a few steps from Piazza Vescovado and Cathedral Square, this charming property is an elegant and sophisticated retreat perched above the endless sea of the Amalfi Coast. Once the residence of the noble Cortese family, today Villa Fraulo offers a modern, relaxing spa and a spectacular infinity pool surrounded by a terrace. Built in 1900 in the Art-Nouveau style, the Grand Hotel Santa Lucia combines traditional Italian elegance with countless modern amenities. With an ideal location at the waters edge in the middle of the Centro Storico, the hotel positions you perfectly to explore the surrounding city. Enjoy views of the entire Bay of Naples, the majestic Castel dellOvo, Mount Vesuvius, and distant Capri. Located on the right bank of the Tiber River between the Piazza di Spagna, the Piazza Navona, and the Vatican, this chic city-center hotel offers access to Romes monuments, shopping, and dining. Guestrooms and public spaces are contemporary and inviting, including a bar and patio. Overlooking the city is a dramatic rooftop terrace bar and an on-site gym is also available. Arrive at the Capodichino Airport in Naples, Italy, where a VBT representative meets you and helps you transfer (approximately 30 minutes) to our Naples hotel. At the hotel, our VBT representative will be available at 6:00 p.m. to answer your questions and help you organize your time in Naples. Please make sure to arrive promptly at this time since optional activities, like a city walk, will also be discussed to help you make the most of the city. The activities will start the next day, and the cost will be shared among the number of participants. The rest of the day is free to discover and dine on your own, using the VBT City Information as your guide. The area is full of wonderful options for dinner. Continue to explore Naples on your own. Continue your exploration of Naples at leisure. Enjoy breakfast at your luxurious hotel. Spend the day exploring the “Eternal City.” You can step out of Italy while in Rome with a visit to the Vatican, an independent state. The Vatican Museums are filled with magnificent art that goes far beyond such well-known pieces as Michelangelo’s Pieta and the Sistine Chapel ceiling. 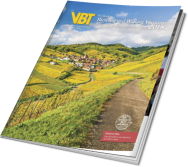 An optional guided tour can be booked through your local VBT Representative or earlier during the year (as we recommend). You can find useful tips in our VBT City Information. Please note: Italian museums are closed on Mondays. Vatican museums are closed on Sundays. You might visit the Forum, the political and commercial center of ancient Rome. Various emperors constructed the temples, monuments and other structures here over a period of nine centuries. Today you can still see the Curia, where the Roman Senate met. Explore Palatine Hill, where tradition says the first settlers of Rome built their huts, and which was later became the home of emperors Caligula, Nero, Tiberius and Domitian. Tour Rome’s famous Catacombs, located in tunnels carved out of rock along the Via Appia Antica, or Appian Way. Or spend an idyllic afternoon in the gardens of the Villa Borghese, one of Europe’s most elegant parks. And by all means, when in Rome—sip espresso, savor Italian wine, and take the time to enjoy la dolce vita. After a full day of independent exploration, retire to your hotel or enjoy dinner in one of Rome’s many fine restaurants. After breakfast* transfer to Rome airport (40 to 60 minutes) for your departing flight**. Please ensure you are ready in the hotel reception area at the designated time. 7 Days. Includes walking vacation only. Splendor surrounds you in northern Italy.